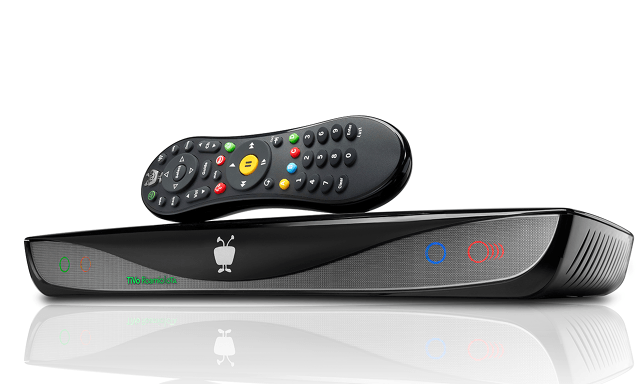 Today, we here at TiVo® announced the launch of the TiVo Roamio® OTA 1TB. Not only is it packing a hefty, new hard drive, but it also comes with an all-in price of $399.1 In other words, no requirement for an ongoing monthly subscription fee! The TiVo Roamio OTA 1TB comes standard with our latest and greatest features, such as SkipMode™, which allows you to skip entire commercial breaks of recorded shows with the press of a single button,2 and QuickMode™, which allows you to watch your recordings 30 percent faster with pitch-corrected audio. The bigger hard drive means up to 150 hours of high-definition recorded programming3 at your fingertips from local networks including ABC, CBS, NBC, FOX, PBS and Univision, where available with an HD antenna. Users can also enjoy access to their content and subscriptions from the top internet video services,4 such as Netflix, Hulu, Amazon Prime Instant Video and YouTube®, among others. Casting: Cast your favorite Netflix and YouTube video from your mobile device to the TiVo Roamio OTA 1TB.5 No need to buy a Chromecast™ dongle; casting is built-in. Tru Multi Room™ Video: Works with the industry-leading TiVo Minis. Live, Recorded and Over-the-Top (OTT) content with the same interface on every TV in your home,6 including power features such as SkipMode. Compatibility with TiVo Stream: Stream and download live and recorded TV to iOS and Android™ smartphones and tablets, both in and out of your home.7 Or watch your recorded shows on an Amazon Fire™ TV or Apple TV® in another room of your home. The TiVo Roamio OTA 1TB is available for $399.99,1 a one-time payment including TiVo service. The TiVo Roamio OTA 1TB will be available May 2, 2016 at TiVo.com, BestBuy.com and Amazon.com, and at participating Best Buy stores. SkipMode feature is not available for all recorded shows. Your actual high-definition recording capacity may vary, based on television signal source and content. Broadband internet connection is required to access and receive streaming content. Availability of third-party content from streaming sources is subject to change, and certain third-party fees may apply. Certain content provider restrictions may apply. Streaming to other TVs within the home requires a separately purchased TiVo Mini (with service included) for each TV. The TiVo Roamio OTA 1TB works optimally with up to four TiVo Minis, and potentially with up to ten TiVo Minis. A multi-network adapter (sold separately) may be required. Requires iPad®, iPhone® or iPod touch® device running iOS 7.0 or later, or Android mobile device running 4.1 or above with a non-Intel or AMD chipset (sold separately). Not all recorded content can be streamed or downloaded to a mobile device (due to copy protection assigned by content provider and/or other technical limitations). Some recorded content can only be streamed/downloaded to your mobile device when you are on the same network as your TiVo Stream. Out-of-home streaming (a) will support streaming to only one of your devices at a time and (b) may not be available for all recorded content.